Oh, look. Another article about climate change. What a surprise. This time we’re focusing on New York City and what can be done to protect it from both rising sea levels and from future storms like Sandy. One possibility is to build storm barriers and another is to build a chain of barrier islands. Apparently there used to be barrier islands in New York Harbor, but they were removed “by . . . landfill projects,” which I assume means that the islands are now part of either Manhattan or one of the other boroughs. Folger suggests that New York City look to the Netherlands for ideas. The Eastern Scheldt barrier which protects Zeeland, is built to a much higher standard than is usual in the United States. The dike system in Holland is not walls, as we picture, but are sometimes built almost invisibly into the landscape (Folger visits one that just looks to the casual observer to be an ordinary hill). Rotterdam is also working on building floating buildings and are planning on having floating residences actually in the harbor. We return to the United States and talk about some of the other places that could benefit from these kinds of remediations, including New Orleans and Miami. Miami is a special case, however, because it sits on a limestone base, which means that you can’t block out the sea water — the water will just come up from underneath. This might be a job for those floating buildings that they are working on in Rotterdam. I always loved dinosaurs. When we visited the Field Museum, I always had to visit the dinosaur hall. My now-ex also always loved dinosaurs. Early on in our relationship, we talked about how we’d always wanted to take the time to count the bones in the apatosaurus’s tail (though we still called it a brontosaurus at the time) but that the adults we were with always would get bored before we finished and drag us away. So, of course, early in our relationship, we went to the Field Museum and counted the bones in the tail. It was nearly 30 years ago, so I can’t remember the exact number we got, but 82 sounds familiar. 82? 182? I can’t remember anymore. With two dinosaur-loving parents, it was no surprise that Alex turned out to be fond of the big critters as well. A wonderful thing had happened in the time between my childhood and Alex’s — they discovered that birds are theropod dinosaurs. I never had to tell Alex that dinosaurs were gone — they were all around us. It was magic. The San Antonio Zoo is kind of bird-intensive. The zoo has something like 750 species, 170-some of which are birds. When I bring someone new to the zoo, I always tell them that I need to show them our dinosaurs. They usually expect me to take them to the Komodo dragons. Instead, I take them to the cassowaries — the birds have big three-toed dinosauresque feet and a casque on the head that always makes me think of parasaurolophus (the duck-billed dinosaur that has a crest on its head). This is a roundabout way of saying that I love cassowaries and loved this article. Judson takes us to the Daintree Rainforest in Australia in search of cassowaries. We “meet” Dad, who has four chicks (cassowary fathers take care of the young) and learn about the importance of cassowaries in the ecosystem. Cassowaries eat fruit and the seeds pass basically undigested through their digestive tract. This spreads plants around and increases diversity in the rainforest. One tree, Ryparosa kurrangii, basically only germinates when it’s been pooped out by a cassowary. Scientists are unclear on why being partially digested has such a beneficial effect on the seeds. 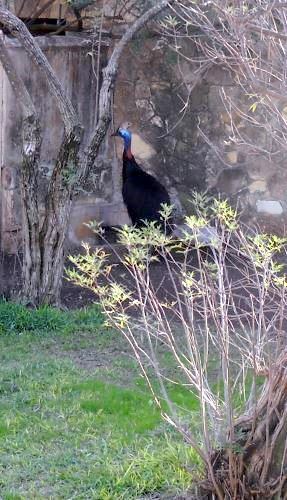 We also learn some of how humans are threatening the future of the cassowary. 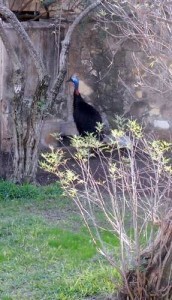 As humans encroach on their territory, there is less space for the cassowary. Some are killed by dogs or in traps. And some die by being struck by vehicles. There are several schools of thought about how to help the cassowary in the future, but no consensus has been reached yet.